The North Bank Business Improvment District has unveiled its vision for the Aldwych and the parallel length of the Strand. The vision is to remove of the Aldwych gyratory and create a new civic space at the heart of the area. 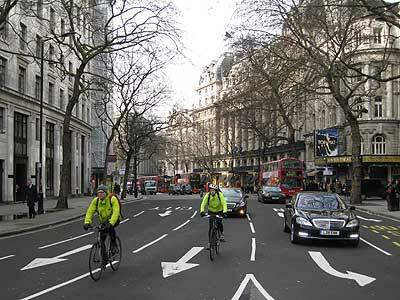 It aims to do this by returning the Aldwych to two-way operation and restricting the parallel length of the Strand to buses and cycles. The Aldwych currently has five lanes of one-way traffic. The Aldwych / Strand gyratory system currently carries several lanes of fast-moving one-way traffic. It is an intimidating environment for cyclists and access to and from King's College and the LSE can be difficult. It also sends southbound buses on a long detour. So we would be better off without it. The vision has been produced by the North Bank BID in partnership with Westminster City Council and Transport for London as well as local stakeholders. The next steps involve modelling and testing the proposed traffic scheme as well as public consultation.